Finished artwork should be protected from general dust and pollution by application of a thin layer of varnish. These products impart a protective satin, gloss, or matte layer to finished paintings. They can be mixed. Finished artwork should be protected from general dust and pollution by application of a thin layer of varnish. These products impart a protective satin, gloss, or matte layer to finished paintings. They can be mixed, allowing the artist the option of any finish from gloss through to matte. 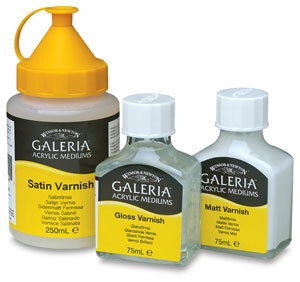 They can easily be removed with acrylic varnish remover without damaging the painting.